The Delphi SkyFi2 Satellite Radio is a feature-packed unit that delivers XM Satellite Radio plus a whole lot more. 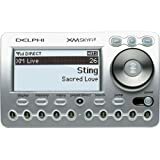 In addition to XM's 130-plus channels of music, sports, talk, news, comedy, kids programming and more, you also get an innovative pause and replay function, a stock ticker, streaming sports scores, TuneSelect, a built-in wireless FM adapter and other information extras. A 30-minute replay feature means you won't have to miss a thing. Just pause and replay up to 30 minutes of a live XM broadcast. SkyFi2 is fully compatible with existing SkyFi accessories. Requires subscription to XM Satellite Radio. Not available in Alaska and Hawaii. Imported. 2-15/16Hx4-11/16Wx1-1/2D".